Love. Muddled green, studs, medieval armor-visor thing in the back. Wow. Maybe $45? Wasn't really paying attention to price as I figured I'd find it on the website. Nope, not on website yet. These are fresh off the boat from China, people, sent straight to 34th Street. They also come in black. Get there quick, Pat Field's Payless shoes go fast. Click here to get 15% off the boots. really like the lace up bot and the price is even better! OMG i must have the lace up moccasin boots...am planning trip to 34th street NOW! Hi there-I adore those top ones, they're soo gorgeous!! I love them both! Are they actually comfortable? LOL @ fresh off the boat from China -- literally. 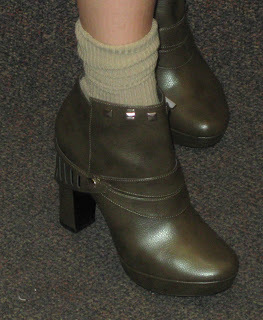 wendy - the mocassin boots are comfortable, the green ones felt pretty good for frankenstein-like platform. and hey, you won the wichcraft card! email me a mailing address and i'll send it off on monday. Love both, but those first ones broke my heart. I really like that tall fringe boot! Great prices for boots that, in my mind, are too trendy to shell out big money on. Wow Miss Herald, they both look great! We'd opt for the boots if forced to choose. Although couldn't you just text Kira Plastinina and ask her to help you pick? 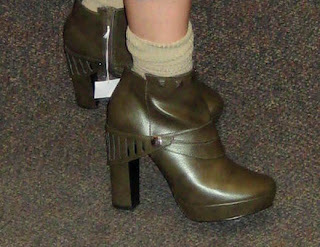 BTW, those were awesome patent booties or shoes or whatever one calls them from yesterday at her emporium. tbb - now I'm kind of panicking, b/c I didn't buy them yet! dressed - I'm ready, serious! sharon and dapper - they are great, I'm ridiculous impressed. seeker - email me if you want me to act as personal, Pat Field tall moccasin boot shopper! enc - yup, me too. la belette - totally exactly. tp - i think you need to shop kira for me in the midwest, just once please! it is VERY pink! farren - they must be going on the site soon, if not we'll for sure figure something out. 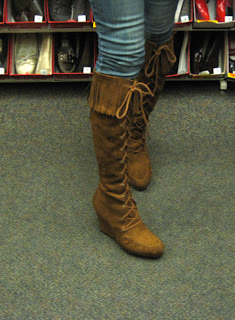 these boots are too awesome. I had no idea she was doing stuff for payless, how cool!! Great shoes...but my feet are hurting just from the pics. I'm especially impressed with the lace up boots-It would take me 15 minutes just to put those on! yeah those lace ups will sell fast I reckon. They look great! The first boot is beautiful! Those last boots are KILLER! And so is the price. I have some Minnetonkas a lot like the first pair, but these look like they have a little more structure, which I love. OH my god, have to have the Moccasin boots! They are soo cool!! Sweet! I have those boots. They do indeed rock.